This issue, we sit down for an interview Sophie Reicher. A magician and a Northern Traditionalist, Reicher blogs at Sapere Aude. Author of Spiritual Protection and a forthcoming “magickal q&a,” Reicher here discusses the necessity of fundamental centering/grounding techniques, the nature of magick, and just who the heck Baphomet is and why He’s so important. Sophie Reicher: Wow. I’m usually asked to speak more to magical practice than religion but I do have my opinion so here you go: Paganisms, contemporary Polytheisms (and I use the plural because if we talk about Paganism, we’re talking about more than one religion) are first and foremost legitimatereligions. Polytheism is a theological view that predates monotheism by thousands of years. Monotheism is a fairly young aberration in the scope of religious evolution. It is not a pinnacle of religious evolution. Polytheism isn’t an inferior or immature way to relate to the sacred. I’d like people to realize, above all else, that we are not godless. We have many Gods and Goddesses and our relationships with Them are grounded first and foremost in pietas and respect. EHS: What is your spiritual path or tradition? SR: I am a Northern Traditionalist, a polytheist and animist. I honor my ancestors, the spirits of land and place, many Gods and Goddesses (most of Them Norse), and the elemental powers. EHS: You are currently putting together a “magickal q&a” book. How do you define magick, and how are you using that definition for the purposes of your book? SR: Personally, I’m old school and I’ve little use for contemporary feel-good metaphysics. Magic is an esoteric Discipline. Magic is about using your will to wield energy to achieve a verifiable result. This can be done by honing certain inborn talents for sensing energy in some way, and by developing a certain skill set, a tool box of techniques. Magic is about learning how to wield power, power to change one’s world according to one’s wishes. That starts, of course, with power over oneself. I’ve no use for any drivel about magic equaling the power to change one’s consciousness at will. That’s a technique that may be useful for magic, but it is not actually magic. Magic is about getting results and if you’re not getting predictable and verifiable results external to yourself, you’re not working magic. Now, that being said, there are thousands of techniques and practices to help develop the necessary skill set to be a functioning, competent magician. I think sometimes people mistake specific techniques – like being able to trance — for the Discipline itself. EHS: What kinds of questions will you be answering in the book? Are you open to questions submitted by the public? SR: I’m open to answering questions about magic, questions about different branches of magic, questions about various techniques (if someone asked me ‘well, how do you change consciousness at will’? for instance, I’d answer them, because this is a useful technique to know). I’ve a few questions already collected and I’ve been asked how to do a house protection spell that takes into account children and pets being present, how to contact one’s spirit animal (not magic per se, but I’ll answer that — I know for some people there is a blending of magic and spiritual practices and in many traditions that is a valid way to work). So I’m encouraging people to send me their questions. If I can’t answer them, I’ll try to find one of my colleagues who can. EHS: Besides your own book, can you recommend any good resources (texts, journals, magazines, sites) on magick and its practice? SR: That’s a really hard one. There’s way too much crap out there. It’s also hard to find material that isn’t tradition specific. There are several blogs that I like: Kenaz Filan, Gangleri’s Grove,RuneSoup, and Queen of Pentacles Conjure and Witchery Blog. What I’ve read here has been sensible and I know a couple of the bloggers (not all of them) and personally know their work to be solid. For hoodoo, I recommend Cat Yronwode’s Lucky Mojo. She has an excellent online course in hoodoo and rootwork that is just fabulous. She really knows her stuff. After this, it gets a bit tricky. 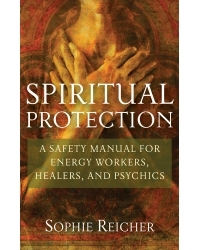 Certainly, I recommend my own book Spiritual Protection: A Safety Manual for Energy Workers, Healers and Psychics , primarily as a beginning manual that will teach the reader the fundamental techniques which they can then expand upon. I’ve noticed over the years that it’s becoming more and more common to not only omit the teaching of these techniques, but actually telling students that they’re not necessary. This is a disturbing trend and I think speaks more to people’s growing desire for instant gratification and easy results than to any integrity of practice. So I’d recommend starting with my book. Then of course there are the classics: some of Dion Fortune’s material (if you can stand her style), Israel Regardie, William Grey. I like some of Draja Mickaharic’s work, but he does have an obvious and irritating monotheistic approach. For runes, I like Galina Krasskova’s books. Freya Aswynn also has some interesting material out there. For Wiccans, Chris Penczak is doing some very solid and interesting work. I’d probably start there. I’m very wary of recommending sources. It is really increasingly difficult to find decent ones. You can’t go wrong through with the sources I’ve noted here, at least I don’t think so. EHS: You are also working on a devotional for Baphomet. For our readers who are unfamiliar with Baphomet, who/what is he? SR: I’m not really working on the devotional. I submitted a couple of pieces for it. That’s the extent of my involvement though: two prayers. Baphomet is not one of the Gods in my personal pantheon. I have however encountered Him during my magical training through several colleagues. I’m afraid, not having any devotional relationship with Him I don’t feel qualified to speak to His nature. I’d recommend Raven Kaldera’s Hermaphrodeities , which has an article on Baphomet, or waiting for the devotional to come out later this year! I would not wish to show disrespect to any Deity by speaking out of turn. EHS: Why a devotional for Baphomet? SR: Mostly because a friend of mine was editing it, and another friend wrote at least half of the submissions and they both asked me if I had anything I could contribute. I wrote a prayer to the forces of rot (because without rot, our world would not be very nice — think about it: what if nothing ever decayed?) and a prayer praising the blessings of compost. Baphomet has a lot to do with rot. I wanted to help out my friends so I contributed what I could. I think the primary contributor wanted to do the devotional because she is a devotee and servant of Baphomet and enlisted the editor’s help. I’m not sure though. It wasn’t my project. EHS: When will these books be published, and where will readers be able to find them? SR: My magical Q&A probably won’t be finished until next year. I’m putting it out through Ellhorn Press, an imprint of Asphodel Press. I’ll advertise on my site when it’s available and I’m sure my friends will advertise it too and it will be available at Amazon. I’m purposely not giving myself a deadline for this project – I’ve a fairly busy life and writing a book can be exhausting. I’d rather work on it little by little and give myself time to compile a thorough series of questions. I think that will make it a more interesting book. I’m not sure when the Baphomet devotional will be ready. As I said, it’s not my project. I know the manuscript has been submitted and I heard through the grapevine that it’s nearly finished so probably by early 2011. That’s being put out through Asphodel Press too and will be available at Amazon or on the Asphodel Press site. SR: Right now, the Q &A book primarily. I’m also in the process of outlining a third book, sort of my polytheistic flavored version of Regardie’s One Year Manual. I’ve a few pieces coming out in various devotionals. I just had two prayers in Janet Munin’s Queen of the Great Below: A Devotional in Honor of Ereshkigal and one article in Joshua Tenpenny’s Honey, Grain and Gold , a Frey devotional. I was very happy about that. People keep pushing me to expand my blog and be more active there, or – Gods forbid — to get FaceBook but I really just don’t have the time, and I don’t like FaceBook. EHS: Which book fairs, conventions, et cetera will you be attending in the foreseeable future? SR: None, if I can help it. I like to keep my life fairly private and I find conventions and the like exhausting. I’ll leave that to my teachers and peers. I do have a couple of radio interviews coming up though, and I’ll be posting about that on my blog. In the preface of her book Spiritual Protection, MS Reicher states she ‘stumbled upon a series of novels that dealt fairly accurately with the gifts…’ I am curious what is the name of this novel series?